In an age of belfie sticks and USB cufflinks, it should be no surprise that humanity would give birth to the Super Gorone Desk - a portable surface that can be contorted into many shapes, most notably a bed desk. 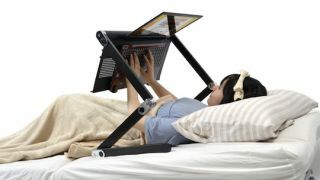 Upside down laptop usage doesn't look too comfortable to us, but who are we to judge? Especially for the paltry price of just $121. Or maybe just buy a tablet instead. Whatever, we're not going to live your life for you. Read some more blips and weep for humanity. Someone has invented the belfie stick - has science gone too far?